Being the capital of Belgium, Brussels is a warm cosmopolitan city that needs to be seen in the middle of Europe. The city, which is the center of three main establishment of United Nations namely UN Commission, UN Council of Ministers and The European Parliament, is also the city of mussel and waffle. There are many things to talk about and see in Brussel from its coffee houses to designers, from antique markets to restaurants, from tables where only English is spoken to immigrants from Congo. 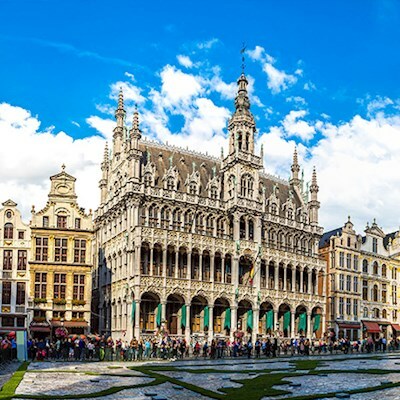 If you want to explore this peerless city, you can take a look at our recommendations and reserve your seats on flypgs.com by using the advantage of cheap tickets to Brussels. The Pegasus plane, which departs from Sabiha Gokcen Airport at 10.35 am every day of the week, reaches Brussels Airport at 1.05 pm. You can use different means to reach the city after buying the most economical ticket you'll find on flypgs.com. The most practical means of transportation between the airport and the city is going to one of the Brussels North, Midi or Central stations by taking the train, which takes off every 10 minutes. If you want to have some information about the timetable beforehand, you can check http://www.belgianrail.be/en/Default.aspx. There are taxis for those who prefer a more comfortable trip. The best thing to do is making a reservation by calling +32 2 752 98 00 or using the website:www.hendriks.be. For bigger groups. you can contact Directway, which provides minivans or buses, on their website www.directway.be or by calling +32(0)2 772 00 00. If you prefer renting a car, you can make a reservation on flypgs.com. Bus can be one of your options since it's cheap. You can take the bus with the code "De Lijn 471" at the bus stop located on the ground floor of the airport or reach the city center in 30 minutes with MIVB/STIB shuttles that can be found in Platform C.
In Brussel, the most popular way of transportation in the city is walking. However, in case you're short in time or you don't like walking, we want to remind you of other options that are suitable to you. Brussels has 4 main subway lines: The purple line is between Gare de l'Ouest – Stockel; the red line goes between Simonis-Leopold II - Simonis-Elisabeth; the yellow line is between Erasmus - Hermann-Debroux; and the blue line goes between Simonis-Elisabeth - Roi Baudouin. You can get a city card, which is called Mobib, to not buy a new ticket every time you use the subway. You can also use trams, which reaches almost every part of the city center, to see the city while transporting instead of going around underground. In Brussels, no one expects you to show your tickets in any public transportation. However, there are random ticket controls and it has a big penalty if they realize that you don't have a ticket. If you ask about the famous foods of Brussels, the first answer you'll get will be mussels floating on plates of sauce and fried potatoes on the side. Here are the best addresses where you can taste this delicious pair and cosmopolitan Brussels food. This place is popular especially among locals. You can choose one of the green pepper, Béarnaise or mustard sauces for your meat or taste mussels, which is a Brussels classic, with tomatoes and Roquefort cheese. Don't forget that a cheese plate is served after the meal as a French tradition. Make sure you'll save some space for that too. The service starts at 7 pm in this restaurant which is mentioned in almost every single Belgian guide. What you're expected to do is consume the mussels, which are served in boilers, as fast as possible and leave since there are many people waiting outside to be seated at your table. We recommend you not to forget about mussels by eating too much of the crispy fried potatoes of which plates are constantly refilled. Houtsipou, of which walls are covered in colorful comics, makes delicious hamburgers with gorgonzola cheese, mushrooms and barbecue sauce. Here, it's possible that all the tables around you will be speaking in a different language. The egg sauce that is poured on white asparagus. Their mussels and unlimited fries are impossible to describe. This is a unique restaurant which is open between 8pm - 10pm from Tuesdays to Fridays and betweeen 12pm - 2 pm on Fridays. Chef Nicolas Scheidt has the same motto with Jamie Oliver: Simple but delicious. Menu changes every day; seasonal ingredients are brought together and served in plates that are nothing less than artworks. There are special menus which include five French-inspired dishes served one by one in this restaurant where you can be seated at a big table for two or in a special area for you in the kitchen. We can't say that it's inexpensive but no doubt, it'll be worth the price. We can say with a clean conscience that Mano a Mano makes the best Italian pizza in Brussels. It doesn't matter whether you want a pizza carpaccio, a simple napoliten or one of the options with pepperroni. The result is always the same: Happiness. If you're in the vicinity of Grand Palace, you should start your seafood feast with oysters, move on to snails with pesto sauce and then order mussels flavored with tomatoes and garlic in this 80-year-old historical restaurant. On the contrary of some restaurants that are closed on Sundays, Aux Armes de Bruxelles is open until 10.30 pm. In this place, whose name means "Sudden Death" and is known as the meeting place of bank and European Union workers during lunch time, ordering tartine will be the most delicious choice you can ever make. It's been preparing the most traditional dishes of Belgian cuisine since 1882. The restaurant, which has options like fondue, calf carpaccio with parmesan, entrecote and gadus, is one of the spots you should definitely stop by in Brussels. Chez Léon, which you'll remember with its Paris branches, is actually from Brussels. Its meat, pasta, salads and fish are delicious but you must eat mussels while you're here. In addition to classical mussels with tomatoes and roquefort, you have many other options like with vinegar, with lemon, fried, baked with parmesan, or in gambas style served with calamari and octopus. You can visit this restaurant designed by students of Victor Horta, who is the inventor of art nouveau architecture, even only to admire its architecture. Shelled seafood plate and calf tartar are the top two tastes you need to try here. The most crowded branch of the cafe, which has many branches, is the one in the Sablon Square. They have whatever your want from freshly squeezed juice to handmade breads, croissants to jams, white chocolate marmelade to cheese in their breakfasts and they are all delicious. If you want to dive into a pleasure of nicely fried potatoes served with tens of sauces while on the run, this is the right address. The meal that starts with lobster soup with spring onions continues with jumbo shrimp risotto. Veal with truffle and arugula is recommended for those who don't like seafood. Even if not for a dinner, you should drop by its lounge for a cocktail or visit its shop to buy truffles and fresh kitchen products. This can be called a freelancer cafe. It's the most popular place in Saint-Gilles region. You can see someone sitting with a laptop at every single table. It won't be easy to forget the tastes of the delicious lentil salad or chicken sandwiches, which are offered in self-service form. They organize concerts in the evenings; it's a good idea to check their program to explore local musicians and DJs. For a typical European shopping street, Rue de Neuve; to take a look at boutiques, Rue Dansaert;to look for clothes or gifts, Rue du Flandre and Marché au Charbon and for designer stores Waterloolaan should be the addresses you prefer. Especially Antwerp region of Belgium, which is in the Fleming part, is a heaven where worldwide renown designers are raised and fashion design schools and talented students can be found. There are names like Diane von Fürstenberg, Ann Demeulemeester, Martin Margiela, Dries van Noten, Kris Van Assche, Raf Simons and Walter Van Beirendonck among famous designers who were born in Belgium and got their inspiration from this country. There are many different choices in Brussels for accommodation. You can pick the one that is most suitable for your taste and budget among Brussels hotels with elegant options that speak to luxury lovers or hostels that take students into consideration. This new hotel on the coolest shopping street of Brussels called Antoine Dansaert has only 13 rooms. It has white big rooms for romantic breaks and a comfortable atmosphere which allows you to hang out for a whole day in its cafe downstairs for freelancers. Its difference from other hotels of Royal Windsor is that every single room of this is created by one of the 13 Belgian designers. It's up to you whether you'll choose Xavier Delcour's 360 degrees mirrored room, the dream world created by Kaat Tiller or Marina Yee's Grand Palace but it's guaranteed that you'll find very different things in each room. If you've reserved your place in Amigo, you'll find yourself in a heaven in a building dating back to the 18th century with Tintin illustrations in it which has a spa where you can relax. Midi Station's vicinity, where drunkards and homeless people used to live, is turning into a hit neighbourhood thanks to investors who have bought buildings there. Being founded in the middle of this, BeManos offers you a modern and stylish atmosphere with its elegant black and white design. This building, which was built for the Spanish Consulate in the 17th century, is now a hotel with crystal chandeliers where luxury lovers will leave satisfied. Spacious, white, stylish and central. White has anything you can ask for in a hotel. This youthful hotel which has a work of Belgian designers in each room and organizes wild parties with DJ and VJ sets a couple of times a year, is especially adored by those who work in creative fields. This hotel, which has been designed in a modern, hippi and minimal New York style in a former monastery building, has a unique atmosphere. And the restaurants inside are Brussels' gourmet addresses where even locals make reservations to visit. Do you like the pop art culture of 1970’s? What about staying in a hotel filled with these? Every item of Vintage Hotel, from coffee mugs to sheets, phones to carpets, are picked in accordance with the Pop-art style. It creates the feeling of taking everything from the chair you sit on to the forks home with you. An old building; each of its rooms are decorated in a different style and each room has a conceptual breakfast. This hotel will make you feel things you haven't experienced before. With peerless artworks, museums, squares, streets, waffles and chocolates, Brussels is a true tourism heaven. We've listed all places to see in this small city. Atomuim, which was built in 1958, in the year The World Fair was held in Brussels, is in the form of a 150 million times magnified iron molecule. You should take its lift and sit at a table in Chez Adrienne restaurant and watch Brussels from above. Also, the replica of 350 buildings from 80 countries in Mini Europe, which is located at the foot of the building, is worth seeing. The city center, the square where cafes located side by side, the heaven of falafel and ice-cream shops and the heart of shops where touristic products can be found, Grand Place is where you can see light shows, concerts and theatre plays almost any time throughout the year. This 61 cm peeing kid sculpture, which is the symbol of Brussels, has been through a restoration in 1619 after its creation in 1388. According to the legend, the little lord, who had been enslaved by Berthouts during a war, put in a basket and peed while swinging on a tree, caused the war to be won. Apart from Neuhaus, Leonidas and Godiva, which have other branches, Pierre Marcolini, which has only one store in Sablon Square, and Wittamer, which has been known as the chocolaterie of the Belgian royalty since 1910, are among the brands that keep making the art of chocolate. Also, if you're a chocolate lover, don't leave Brussels without seeing the chocolate museum and learn its story. In Belgium, which is the homewotn of many classical comics like Tintin, Spirou, Gaston, Smurfs and Red Kit, we should also give the names and addresses of some comic stores. If you like second hand, Evasions (147, rue du Midi); if you want them brand new, Brüsel on Anspach Boulevard; if you want to hear some advices from some experts, La Bande des Six Nex (179, Chaussée de Wavre) are addresses you should definitely stop by. If you can't be contented with those and also want to learn about its history, you should visit Belgian Comic Strip Center in Rue des Sables 20. In the 200 year old building, there is a collection of more than 20.000 paintings, sculptures and charcoal drawings. Bosch, Bruegel, Cranach, Memling, Jordaens, Rubens Delveaux and Magritte are some of the masters you'll come across. Your visit to Brussels doesn't count unless you visit the museum of Horta, who is the founder of wrought irons you see all around Brussels, glamourous architecture and Art Nouveau trend. Check the calendar of Bozar, which is home to National Orchestra of Belgium in addition to hosting cinema, theater, music and electronical art events, before going to Belgium. There may be many interesting shows waiting for you. You are in the Museum of Hergé, the creator of Tintin. This museum, which cost his wife Fanny Rodwell 20 million dollars to be built, is the work of the French architect Christian de Portzamparc. In the museum, where you can examine drawings he has done and learn about the details of his life and the works in his studio, some exhibitons that may attract comic enthusiast are also organized from time to time. In the building, that was found in 1835 to exhibit prehistoric pieces collected from all around the world, hundreds of works from artists like Horta, Van de Velde, Hankar and Hobe have been exhibited today. An antique market is set on Saturday-Sunday between 9 am - 7 pm. in Brussels' famous square, of which side roads have art galleries and cafes on them. Also, you can find stores which sell vintage items and elaborately restored antiques that have been collected since 1920s. Sablon, is truly at the heart of Brussels. Bell sounds coming from the neo-gothic church, the antique market that is set on the square on the weekends, galleries, stylish restaurants and chocolateries give the city a unique texture and atmosphere. Mont des Arts is the dwelling zone of artists as the name implies. Almost all museums, Brussels Park, Royal Palace and The Fine Arts Museum has been located around this neighbourhood. There are expats, international companies, crowds that speak Spanish, French, German, Japanese in the European Neighbourhood. It's possible to find a mosaic of people from different races living in a harmony. In the streets of Matonge, there are African hairdressers, African restaurants and shops owned by immigrants from Congo, which used to be a colony of Belgium. This neighbourhood which bears many traces of the two countries' pasts is very interesting. In Saint-Gilles, the life that is lived in the Art Nouveau buildings you admire in the day light, pours into bars, restaurants and cafes filled with crowds at night. After shopping from the most expensive brands in Avenue Louise or Toison d'Or and learning the names of a couple of local designers, Place du Chatalain is a good alternative for a drink break. Ixelles is the neighbourhood of locals. This should be the first place to stop by to hang out in the coffee houses and restaurants in Saint Boniface Square and join the locals. Saint-Gery has an atmosphere that is similar to Brooklyn, Belleville, Brick Lane or Karaköy among restored buildings. Artists leave their studios and meet their friends here. The Brussels locals who start drinking after work prefer squares like St. Gery and St. Catherine. It's possible to taste different drinks in lively bars in these places. A big menu is waiting for you. It's possible to see all kinds of people in this bar which hasn't lost the atmosphere of 1920's jazz clubs. People who come to this club with huge couches start dancing to house music after 12 am. Average age is 35 and above. This is the most lively bar of Brussels whether it's summer or winter. It's cosmopolitan crowd doesn't go anywhere until it's closed at 2 am. The place, which is a meeting point of especially advertisers, musicians, members of European Commission, architects and artists, plays the kind of indie music that won't prevent you from having a conversation there. Hundreds of blue chairs put on the most lively square of Brussels are waiting for locals who stop by to have some drinks after work. If you check the schedule of Café Belga, which plays many kinds of music from house to jazz, rock to indie inside, your stay may coincide with a live performance. he has created. People who make appointments in Le Roi des Belges for a drink with friends after work and then switch to Zebra, which is right next to it, at later hours to listen to live performances of local musician and those who enjoy these two different concept bars created by Nicolay are here. Mappa Mundo, which is another place of Fred Nicolay, is ruled by Latin sounds. You can watch those who dance salsa or cha cha and join them if you like. Although it's actually a restaurant, Belga Queen's cocktails and bar atmosphere is more successful than its food. This place which turns into a club after 10 pm and doesn't give a break to music, guarantees fun. We can describe this place as the club of Saint-Gery region, which is created by filling an old canal. Halles Saint-Gery is one of the places where young people dance to DJ sets that echo in the Art Nouveau buildings. This place is filled with DJs who play techno, house and electronic music until the morning in its two rooms and young people, especially between the ages of 18-30, who can't wait till the weekend to have fun in Fuse. Brussels is generally lived in bars but Fuse is one of the meeting points of people who want to dance until the morning. Every weekend, more than 1000 people who dance to RNB, Groove and electronic music make appointments to dance in Fiesta till the first lights of the day.